Pristine have already issued Furtwängler performances of all four Brahms symphonies (review) but the readings of the Third and Fourth offered here are different ones. I’m familiar with these performances because I’ve owned them for quite a long time in an EMI Références collection of all four Brahms symphonies and other works conducted by Furtwängler (7243 5 65513 2). That was issued in 1995 and it’s a measure of how much progress has been made in the restoration of vintage performances in the last twenty years that I can say without hesitation that these new transfers by Andrew Rose are superior. I’ll comment on that aspect in just a bit more detail in considering each symphony. The EMI Références box gives the date of the performance of the Third Symphony as 8 December 1949 but I’m sure it’s the same recording as the one under consideration here. Furtwängler’s reading is a mighty one. There’s great strength at the start and even when Brahms relaxes a couple of minutes later Furtwängler invests the music with great expression. He generates white-hot energy in the run-up to the exposition repeat, which is taken. Later, the development section has tremendous urgency and that urgency is even apparent when the music slows around 7:00. Just a few days before writing this review I attended an excellent performance of the Third Symphony. In the programme the annotator, a highly respected writer on music, made the statement that “there is no real slow movement: rather there are two lyrical intermezzo-like ones of moderate pace.” I agree with that statement but that’s not what we encounter here. Furtwängler’s approach to the Andante is measured and thoughtful – in the contributions of the woodwind early on every note seems to be invested with meaning. This is a searching performance of the movement. Furtwängler makes it into a true slow movement; in his hands this is anything but an intermezzo. There’s plenty of give and take in the pulse during the Poco allegretto. As an example of how much this performance mattered to those involved, listen to the way the violins sing the principal theme at 5:05; there’s tremendous intensity here. The opening of the finale is broadly taken and great tension is generated. At 1:07 the Allegro bursts forth and thereafter the music is like a river in full spate; there’s terrific dynamism in these pages. Furtwängler manipulates the dynamics and the pulse to great dramatic effect and the music is both turbulent and thrilling. At 6:18 the beginning of the tranquil coda sounds almost ghostly. Tranquil the music may be – certainly by comparison with what has preceded it – but there’s still intensity which Furtwängler winds down almost imperceptibly and with consummate skill. The reminiscence of the F-A-F motif at the end is profoundly satisfying after all that has unfolded in the preceding thirty eight minutes or so. This compelling performance has been transferred expertly by Andrew Rose. Spot comparisons with the EMI transfer show that the Pristine effort has more warmth and fullness as well as greater body. At times I hear an edge to the violin tone in the EMI version and that’s been largely tamed by Pristine. The EMI sound is rather less comfortable in the loud passages. Unfortunately, the Berlin audience were a very bronchial bunch. Andrew Rose says he’s managed to excise a lot of these unwanted audience contributions. Many still remain but I promise you they will not distract you from this exceptional performance. The performance of the Fourth Symphony is on the same exalted level. From the outset the reading is strongly projected and the performance is an intense one. Furtwängler gets so much out of the music, not least the drama and suspense – the latter quality is especially in evidence in the passage between 6:20 and 7:44, which is daringly slow. The end of the movement (from 11:22) is especially highly charged. The Andante moderato is taken more slowly than we’ve become accustomed to hearing it in recent years. Furtwängler seems to explore every phrase for its potential. At 4:13 the cellos sing their theme with great feeling and when their colleagues in the violin and viola sections take over the spotlight they’re not to be outdone in terms of expression. 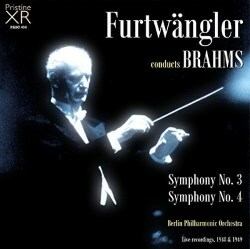 As with the Third Symphony, Furtwängler makes this into a genuine slow movement. It might be objected that his pace is slower than the tempo marking justifies but, frankly, this master conductor stills all doubts through the sheer conviction of his reading. Even in the short third movement nothing is taken for granted. Many conductors treat this as a high-spirited scherzo-like movement and that’s an entirely tenable view which I would normally share but somehow Furtwängler makes more of it. Unsurprisingly, the great passacaglia finale is powerful and probing. The solo flute variation (3:19) is truly gaunt and in the preceding bars the conductor prepares for the flute’s entry superbly. That whole passage (to 6:08 when the full orchestra returns) is profoundly introspective. The closing minutes of the movement are searingly dramatic, setting the seal on a unique and unforgettable traversal of the symphony. I’ve commented on how much Furtwängler finds in and gets out of the music in both symphonies. Lest it should be thought that this is done through any egregious or self-regarding means that is emphatically not the case. The interpretations emerge out of what has clearly been a searching appraisal of each score. The Berlin Philharmonic plays with palpable commitment for him, realising his interpretative ambitions marvellously. The transfer is excellent; once again the comparisons I made showed quite clearly that the Pristine version is richer and fuller than anything EMI achieved twenty years ago. In these performances we hear the music of Brahms as if newly forged in Wilhelm Furtwängler’s creative crucible. It’s an amazing and highly rewarding experience.